In the wake of Tuesday’s election, the airwaves and headlines are exploding with talk of the Latino vote, which is correctly credited with having swung the election for incumbent President Barack Obama. Conservative radio host Sean Hannity and House Speaker John Boehner (R-OH) both spoke out this week on the need to provide a pathway to legal status for the 11 million undocumented immigrants living in our nation. Conservatives at last seem to be catching up to both Latino and non-Latino voters alike, who overwhelmingly support dealing with our undocumented immigrants in a smart and sensible manner. Latino voters vote, and they matter. 90 percent of Latinos in the United States have an immigrant parent or grandparent. 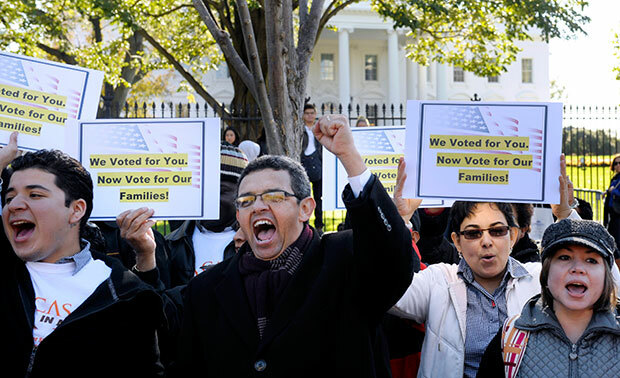 Our nation’s 11 million undocumented immigrants are not an abstract concept to Latino voters. Americans support a pathway to citizenship for our undocumented immigrants. The program protecting DREAMers is the model for broader reforms. Here’s what elected officials need to know about these five post-election facts. It’s already feeling like old news, but it’s worth repeating and remembering—exit polling found that a record-breaking 71 percent of Latinos voted for President Obama in this election. One should note that Latinos were a larger share of the electorate this electoral season, going from 9.5 percent of the electorate in 2008 to 11 percent in 2012. Their votes were especially felt in key swing states such as Florida, Colorado, Nevada, and New Mexico. In Colorado—an important swing state this election cycle—87 percent of Latinos voted for President Obama, and the number of Latino votes for President Obama (261,037) was more than twice as large as the president’s margin of victory in that state (113,099). That means 9 out of 10 Latinos are within two generations of their immigrant roots. It’s no surprise, then, that they are listening closely to both the tone and content of candidates’ message when they talk about immigration. It might be stating the obvious, but undocumented immigrants don’t all live together in one apartment building. In fact, 60 percent of Latino voters know an undocumented immigrant, and one-quarter know someone who is either facing deportation or has been deported. So when Republicans take aim at the undocumented with proposals such as “self-deportation” and ending President Obama’s popular Deferred Action for Childhood Arrivals program to not deport “DREAMers”—immigrant youth who were brought to the United States at a young age and who are not documented but who would be eligible for the DREAM Act—Latino voters see a target on the back of a family member, a friend, or a co-worker. This rhetoric is real for Latino voters. When Americans went to the polls on Tuesday, they were divided on many issues. Exit polls showed, however, that Americans were not divided on the issue of finding a common-sense solution for the 11 million immigrants here without proper papers. Sixty-five percent of those polled thought that undocumented immigrants should be “offered a chance to apply for legal status,” including 37 percent of voters who supported Republican presidential candidate and former Massachusetts Gov. Mitt Romney. In June President Obama lifted the shadow of deportation from 1.76 million aspiring Americans by allowing them to request discretionary relief from removal and work authorization through the Deferred Action program. To date, the program, which officially began in August, has been a success, with 180,000 applications having been accepted for consideration. That’s nearly one-fifth of potential applicants applying within the first two months of the program’s existence. Still, the program is only a band-aid on a much bigger wound, and the economic benefit to going the full nine yards and legalizing this youth is substantial. Fortunately, Deferred Action and the DREAM Act are popular with Latinos and non-Latinos alike. An October poll showed that 64 percent of registered voters, when asked if they thought President Obama’s policy toward DREAMers had gone too far, thought the policy was “about right.” The same can be said of 71 percent of Latinos polled. As is often the case, the public’s thinking is ahead of lawmakers’ actions. Lawmakers can’t afford to sit on the sidelines and avoid working for common-sense immigration policies. Both the politics and policy point toward giving the 11 million people who aspire to be citizens a chance to come forward and contribute as full Americans. Angela Maria Kelley is the Vice President for Immigration Policy and Advocacy at the Center for American Progress. Ann Garcia is a Research and Policy Associate for the Center.